As you can see, those numbers are not substantial by any means, and this is if there isn’t any replacement at all. If a player who adds absolutely nothing is added to the roster, the estimates say Schmidt’s 20 game absence would cost the Golden Knights just one goal, nine points, and about 1.8 points in the standings. Depending on which defenseman you plug in that number will decrease. Adding Brad Hunt, using last year’s stats, would offset 1.02 of the 1.8 points lost by Schmidt. Merrill would offset 0.82. Plus, this doesn’t take into effect the time on ice increase for the “better” players that will actually be replacing Schmidt. Admittedly I didn’t take the time to do all of those calculations, but the numbers indicate missing Schmidt and replacing him at the bottom of the lineup (while pushing everyone up) shouldn’t cost the Golden Knights much more than a point in the standings, if that, over the course of the 20 game suspension. 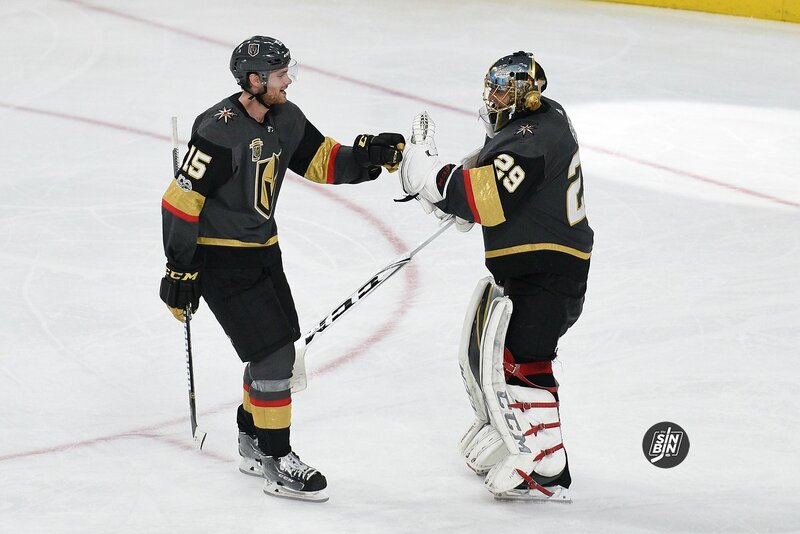 This doesn’t mean it’s not a blow to lose Nate Schmidt for 20 games, it obviously is, but it’s not nearly as significant as what it may feel like when put in terms of “losing the team’s top defenseman for a quarter of the season.” The “next man up” for the Golden Knights isn’t an All Star, or even anything quite like Schmidt, but he’s also no slouch, a bonafide NHL player. In hockey, one skater impacts a game in a fairly minute way. If anyone should know that it’s Golden Knights fans after last year’s magical run without any superstars. So everyone, step off the ledge and relax. Missing Nate for 20 games is not the end of the world. Unless you are the type who likes awesome quotes after games. That will be a significant loss with Schmidt not available to speak. Honestly more concerned about a lack of offense but nothing cap space can’t cure. Feel horrible for Nate, hang in there!!! THANK YOU for a possible name replacement follow up to the loss of Nate at season’s start. Now, it doesn’t sting so much. Great article, and still business as usual to be played at the Fortress! I wasn’t worried about the Theodore situation before the suspension, but I do believe it was ramped up a notch. I like your commentary and follow you. I do see this a bit differently though. In sports intangibles matter. In this case, I think Nate brought positive energy and leadership that at times cannot be captured in a spreadsheet. His energy and leadership impacted the whole team. We’ll see how this plays out; however, I think it’s more significant than you have stated above. McNabb practicing with Whitecloud and Brannstromm, he looked good. Seemed to really be working well, especially with Whitecloud. Worry about the Theodore situation, but maybe McNabb is becoming a more vocal leader with Engelland on the defensive side. As for Brannstromm, never seen anyone so fast. Him losing an edge is even faster than the others. He’s back up before another player would even hit the ground. He’s a cheat code for an old NES game. Does suspension mean he doesn’t even show up to the locker room or keep the bench warm?? If not then his positivity can still be an influence…. he can still keep the team pumped.